Both breathable and durable. Features Kokatat’s Paddling Anatomy Design, 6″ smooth-skin double skirt and protective neoprene gaskets. Made with Evolution 3.2 oz. nylon, 3 layer GORE-TEX laminate fabric. Zippered chest pocket stores small items, and an inner skirt mates smoothly with a spray skirt or Whirlpool Bibs. Exclusive NRS TriTon fabric provides exceptional breathability in a waterproof drytop. TriTon utilizes 450 denier, 10 oz. 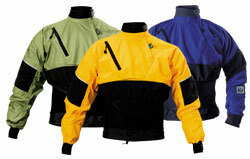 polyester tricot material to enhance vapor transfer to the outside while creating an impenetrable water barrier. 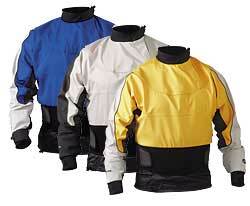 Stretch fabric has been added across the shoulders to mold the jacket to your body’s movemnets. Armored elbows enhance durability. Double-pull hook-and-loop waist closure for a precisely engineered fit. Generously patterned for layering and a full range of motion. Precision-taped seams and durable neck and wrist Latex gaskets seal out water. Made with the mid-weight, breathable Entrant material for extreme mobility. The Plunge is so comfortable you won’t know you’re wearing it. Innovative stretch panels run from the shoulder blades under the arms to conform your body’s motion. 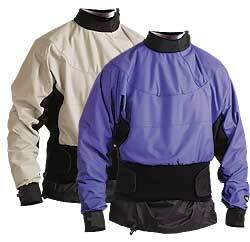 Two, extra-wide hook-and-loop closures give a tight yet comfortable seal at your waist. Latex neck and wrist gaskets seal out water.